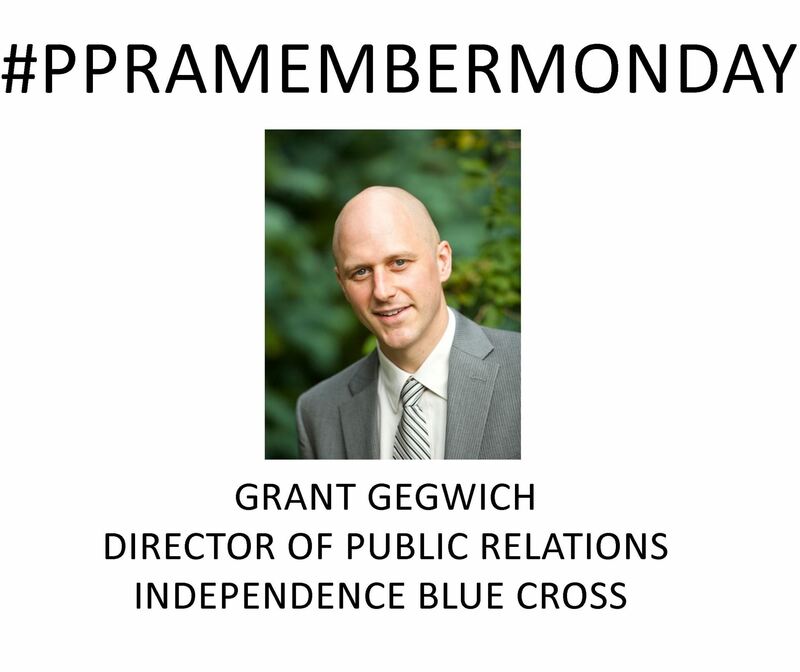 Grant Gegwich is Director of Public Relations at Independence Blue Cross. He's a new PPRA member this year. GG: I joined Independence in August 2017 and now help to lead the company's efforts related to news media outreach, public relations, corporate communications and executive thought leadership. Before coming to Independence, I worked for 15 years with Crozer-Keystone Health System in Delaware County, serving as Vice President of Public Relations and Marketing for the last five years of my tenure there. In that role, I oversaw the strategic public relations, marketing and branding efforts for the five-hospital health system. Before Crozer-Keystone, I served as Director of Publications with Drexel University. I earned a bachelor's in communications from Elizabethtown College and a master's in journalism from Syracuse University. GG: I am working on a range of projects for Independence related to the company's corporate messaging and branding as well as preparations for announcements and campaigns for new initiatives and policies. I'm also part of a team dedicated to updating the the Independence website and am working to enhance our team's media relations and PR efforts using digital tools and social media. GG: I really like my colleagues at Independence. They are very smart, interesting and hard-working. I also like that I work for a company that really seems to care about the community. In my short time with Independence, I've been amazed at all of the great things the company does to support various nonprofits throughout the region, and how employees are actively encouraged to volunteer. GG: I'm relatively new in my my position with Independence, but just recently I had the pleasure of promoting some of the company's efforts to support Philadelphia Eagles fans during the team's Super Bowl run, including sponsoring "underdog" masks in the Philadelphia Inquirer and partnering with SEPTA to offer free subway rides during the championship parade. We have also done some great work recently related to helping to fight the opioid abuse crisis. In my previous role with Crozer-Keystone, I was able to oversee many successful marketing/PR campaigns as well as lead the communications efforts for a number of crisis situations, including layoffs, two five-day nursing strikes, transitioning from a non-profit company to a for-profit company, and intense trauma and burn emergencies — including once when a patient was hit by a bullet inside the hospital. GG: I am a movie buff who has attended the Toronto Film Festival for the last 15 years. Here are three films I can't turn off if they are on: Do the Right Thing, Rushmore, and Back to the Future. Any of the city's very good breweries and beer bars.